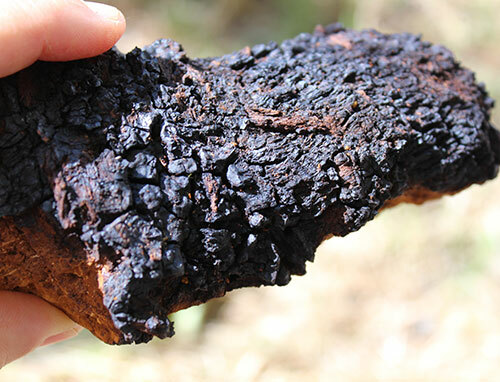 Chaga mushroom (Inonotus obliquus), often referred to as the "king of medicinal mushrooms", looks like a dark black woody mass rather than a mushroom and, in fact, you probably wouldn't even recognize it as a mycelium species when walking through the forest. 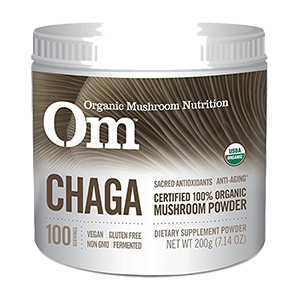 However, this unusual looking variety is one of the most powerful adaptogens and superfoods on the planet due to its potent immune supporting influence and antioxidant levels that supersede most all other medicinal mushroom species. 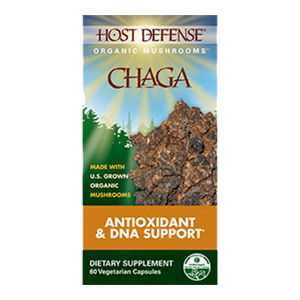 Chaga mushroom teas and extracts are comprised of phytosterols, triterpenoid saponins, beta-glucans and chaga specific myconutrients such as melanin, betulin and inotodiol. The Inonotus obliquus species is classified as a "white-rot fungus", like other medicinal mushrooms such as reishi, coriolus and maitake. 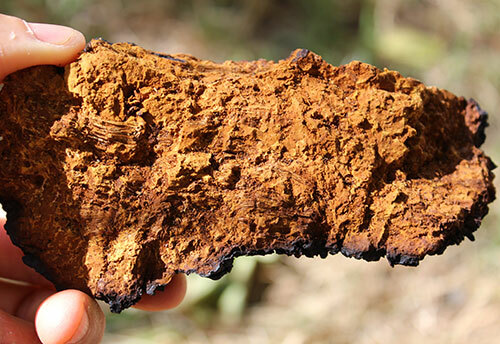 This means that it feeds off of the lignins in the host tree but does not necessarily damage the primary cellulose or integral composition of the tree, unlike brown-rot fungus types. There are debatable theories, however, about its natural life cycle and whether it is protecting the health of the tree as an endophytic mushroom or whether it will eventually act as a parasite over a period of time and hinder the host's growth. "Some wood conks once seen as parasites on trees may in fact be symbiotic endophytes." The tree of choice for Inonotus obliquus is the white and yellow birch tree, although it may also grow on other hardwoods like alder, elm and beech trees. 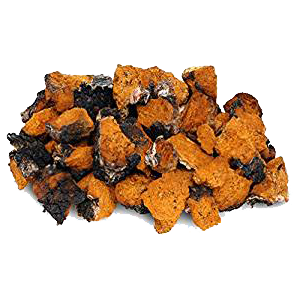 The wild chaga mushroom used exclusively for medicinal use, usually comes from the birch tree only, because of its betulin content. Higher quality mushroom harvests are usually sustainably wildcrafted from birch tree forests growing in Maine, Canada, Northern Europe and Northern Russia, especially Siberia. It is a polypore mushroom (with pores instead of gills) that grows in these colder subarctic climate zones and circumpolar Boreal forest regions found in the Northern Hemisphere. 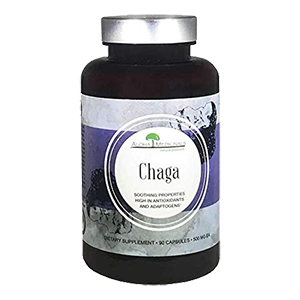 Chaga is known to have an affinity for winter temperatures around -40 °F (-40 °C) and is believed to be one of the components that make it a potent adaptogen. 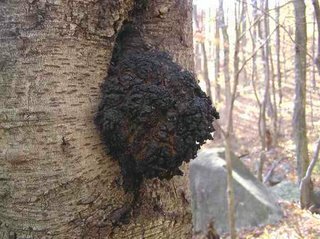 Producing a thick black mycelium mass on the side of tree trunks, often referred to as a "conk", the approximate size of the mushroom is about 10-20 inches (25-50 cm), but this largely depends on age. 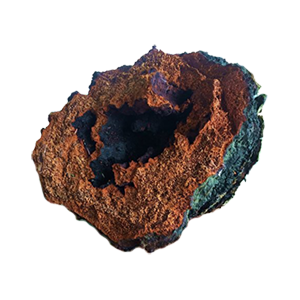 While the exterior of the mushroom looks burnt, like black charcoal, when split open it has a deep clay orange cork-like center. 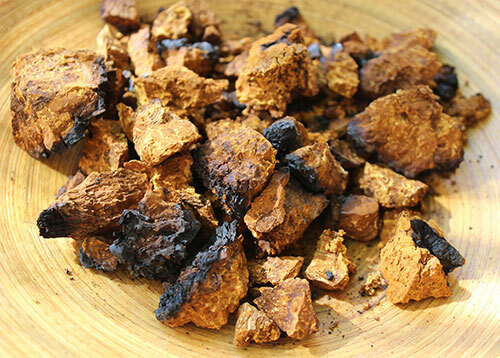 Sometimes called "cinder conk", the chaga species has actually been utilized as a long-burning firewood or kindling source as well as a clothing dye in many parts of the world. Long respected in Norway, Finland and Siberia for its immune supporting qualities, the mushroom became popular here in the West in 1968 when the Russian novelist Aleksandr Solzhenitsyn published the book, "The Cancer Ward", in which he speaks about "the tea from the birch tree mushroom", its healing components and potential benefits to patients. 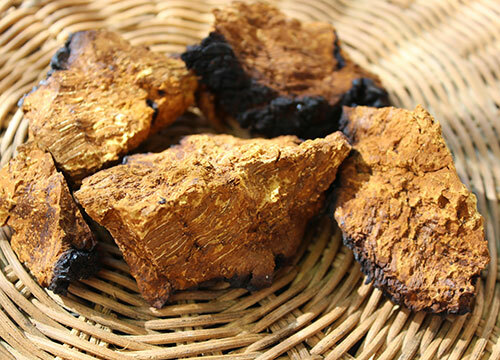 While more scientific investigation is still needed, chaga mushroom has been long-revered "anticancer mushroom" in Russia, where it has been an approved anticancer supplement called Befungin since 1955. 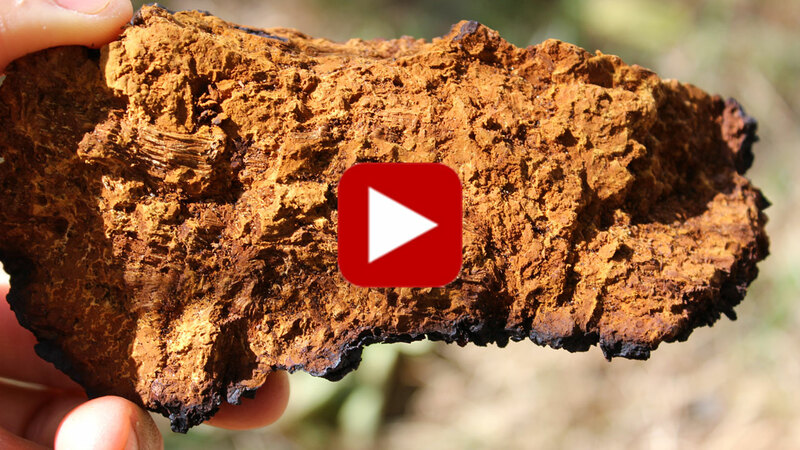 In Norwegian the word for chaga, kreftkjuke, translates "cancer polypore." 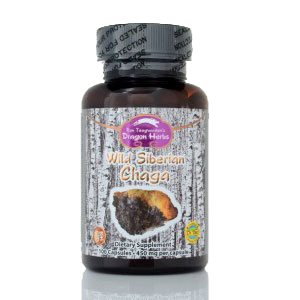 Dragon Herbs, Siberian Chaga Capsules - Provides an encapsulated powdered extract (water and alcohol extraction), with 32% polysaccharides using wild Siberian chaga. 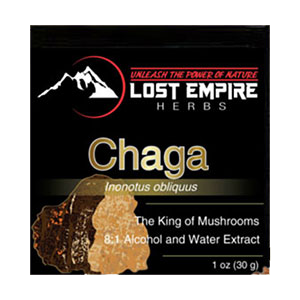 Lost Empire Herbs, Chaga Powder Dual Extract - Offers a 8:1 extract powder created preparing chaga pieces in an extensive dual alcohol and hot water process. It is vacuum concentrated and then spray dried to form a bulk powder. 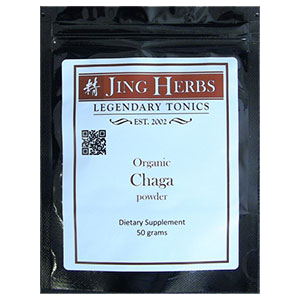 Jing Herbs, Chaga Powdered Extract - Make a spray dried bulk powder from the hot water extract of the hard woody mushroom mycelium. 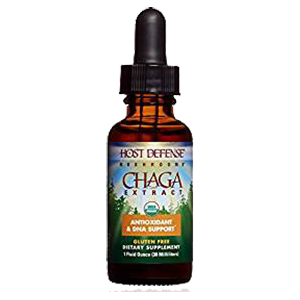 Fungi Perfecti, Host Defense Chaga Capsules and Liquid Solution - This is a company owned by world renowned mycologist Paul Stamets. He primarily grows and uses cultivated and activated mycelium for use in capsules and liquid extracts. Tested at 550mg polysaccharides/serving or 2 capsules. 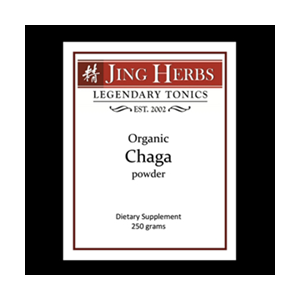 Mountain Rose Herbs, Dried Chaga and Tincture - Offer quality wild chaga sourced from Canada in bulk pieces, powder and in tinctured extract form using a double extraction method. 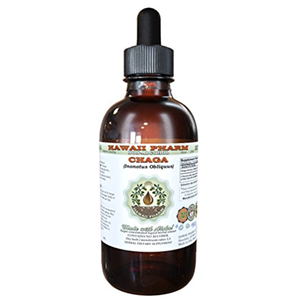 Pure Chaga, Sustainability Harvested Chaga - This has proven to be one of our favorite whole chaga conk suppliers. They are a family owned and operated business who harvest from remote regions in Eastern Canada. 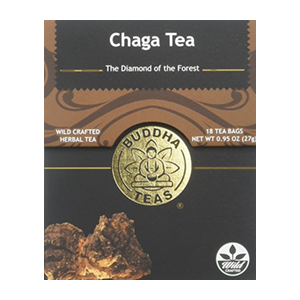 Buddha Teas, Chaga Powder, Tea Bags - These are prepackaged tea bags for easy hot water infusions or can be simmered to retain more myconutrient content. 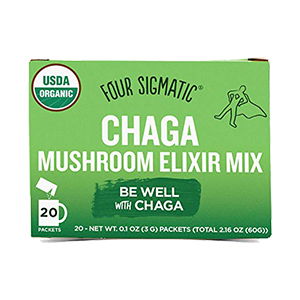 Chaga mushroom makes one of the best tasting teas as it has a rich full-bodied flavor that is truly unique and quite delicious. 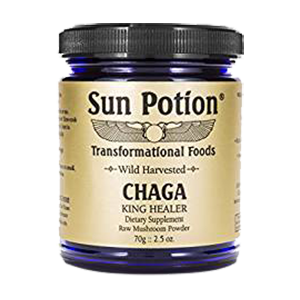 A dark black cup of chaga tea makes a great morning beverage and coffee alternative. 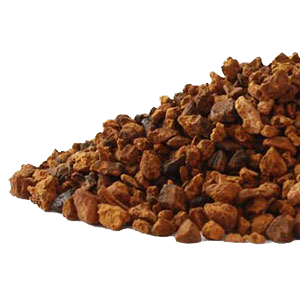 It is necessary to heat it, like other medicinal mushrooms, for highest amount of beneficial myconutrients. 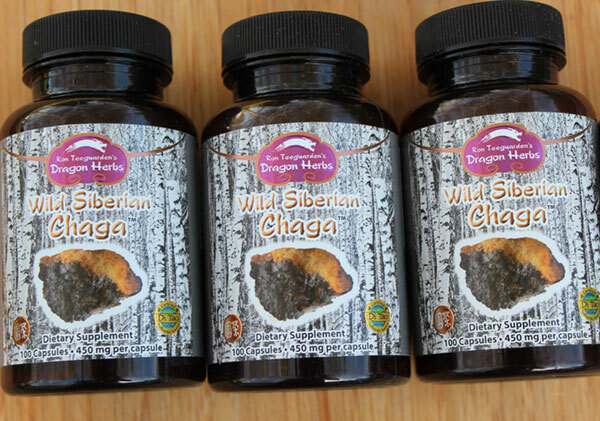 We purchase whole quality chaga conks and break them up into pieces or powder them down in a high-speed blender. From here you can decoct or simmer pieces or powder in water between 1-8 hours, depending on the size. Larger pieces can also be reused. 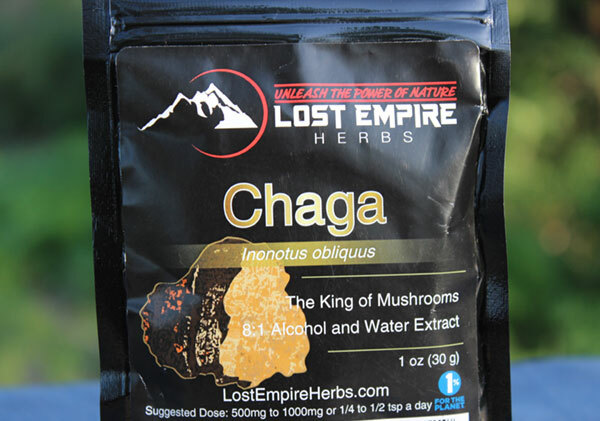 Using whole mushrooms is very cost-effective way to utilize chaga, although it is does take some brewing effort. 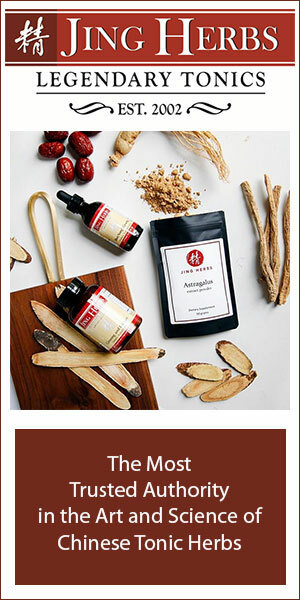 Quality powdered extracts, like Lost Empire Herbs, are our second preferred option as they are more convenient for adding to hot water for an instant tea. 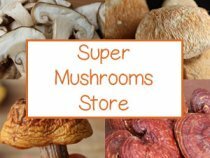 For more on other medicinal mushroom varieties see our other pages on: lions mane, agaricus blazei, maitake and shiitake.